After what seems to been weeks of rain this morning the sun finally re-appeared. At 5:30 A.M. the temperature was 34 degrees and foggy. Now at 7:30 this morning the sun broke through the fog and the temperature is raising fast. Looking on the good side of all the rain. 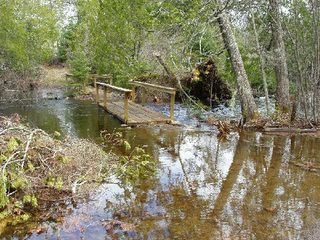 The water level is up in all the Gunflint Trail lake and the creeks are rushing. Cook Country's fire restriction have been lifted but be-it the last county in the state to have the restrictions lifted. 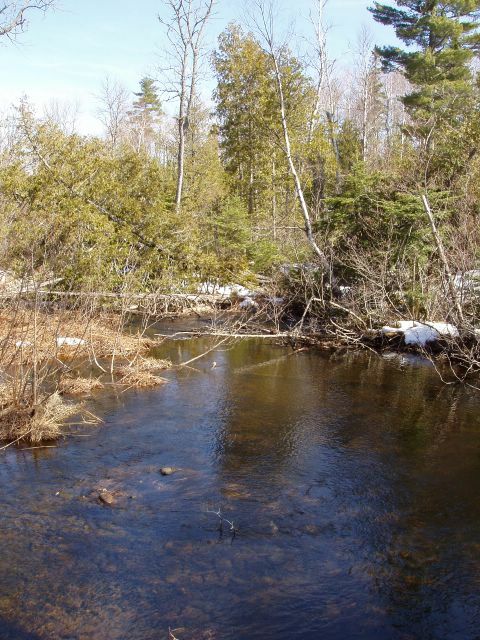 Boundary Country Trekking is offering for sale one last lot along Poplar Creek. The property is part of a five lot twenty acre "open spaces" development. The 1.25 acre lot includes a shared 475 feet of Little Ollie Sale shore, creek frontage with driveway into building site and electrical power to property. Detail of this property available from Stan Poole, Red Pine Realty. A recently enacted rule from the Department of Homeland Security requires that any person traveling from the U.S. into Canada and returning at any location other then an official border crossing must have in their possession a "I-68" form. This means if you go fishing through Saganaga into Caches Bay or Northern Lights or are on a canoe trip where you cross into Canada at anytime during your trip you must have a I-68. Currently this form is only issued, in our area, from the U.S. Customs and Border Protection's office at the Grand Portage Border Crossing. The cost is $16/individual/year and it included the taking of you finger prints. If you think you will be needing this form you must go in person to the Border Crossing. The form is not available online, by phone or fax. Additional information can be obtain from the Grand Marais' office's of the U.S. Customs at 218-387-1770. Note: while an email address for information was previously posted here a U.S. Custom officer demand it be removed because he was receiving emails which he claims he did not have time to respond to. The Canadian government's "remote border crossing" permit, which is also required if you cross into Canada from any place other then a official Canadian Customs office, may also hamper access into your favorite fishing hole. At least you could obtain the Canadian permit without going in person to a Canadian Customs office. Nor does the Canadian permit require your finger prints. Canoes, fisherman, snowmobilers or anyone crossing and returning into Canada at a "remote border crossing" you can thank Home Land "Security" for the extra hassle- no telling what you fisherman are hiding in those walleyes you are bring back. Ted Young, Gunflint Trail- Fifty years ago next year, as a teenager and fishing guide working out of Rockwood Lodge, I headed out with a party of fisherman to Caribou Lake. Upon crossing the portage from Poplar to Lizz Lake I was shocked to find that a road had been built through the portage. This new road, I soon found out, was the Finn Lake Road and it had been constructed by North Star logging, a subsidiary of Kimberly-Clark. The Finn Lake Road gained access to the Moon Lake Timber Sale, a large track of timber the company was cutting west of the Lizz Lake portage. Previously to the construction of this road, timber was trucked from this sale down to Poplar Lake near the Meed's Lake portage and then trucked across the frozen lake in winter or rafted across during the summer. Old log timbers still line the shore where the logs were stacked before they were rafted across Poplar. With the construction of this new road the logs could now be hauled out by land, year around, to what is now called the Lima Grade road and then onto the Gunflint Trail. According to Hank Larson of Grand Marais and who was logging in the area, "in l962 there were some eighteen to twenty-four men logging in the Finn Lake area. About twelve of them were "shackers." Shackers is the term used to describe the men living in the camps. Logging continued along the Finn Lake Road until shortly after the passage of the 1964 Wilderness Act. Starting at the Lima Grade Road the old eastern end of the Finn Lake Road has been renamed the Little Ollie Road. This road now lead into the Poplar Creek Guesthouse and serveral cabins on Little Ollie Lake. From Little Ollie Lake on the Finn Lake road is now the eastern half of theBanadad Ski Trail (map). What is now called the "Old Logging Camp," located six miles west of the Banadad's eastern trailhead, is the site of Kimberly Clarks main camp for the Moon Lake timber sale. All that remains on the site is a wide spot along the trail, a dilapidated outhouse and an old oil-heating stove. The trunks of some of the massive white pines taken from the sale can still be seen stacked along the trail just west of the Meed's Lake portage. Next year will be the fiftieth anniversary of the building of the Finn Lake Road. When I came upon this road in 1956 and was totally shocked, little did I know how important this road was to become. Without it there would be no Banadad Ski Trail. Truly we owe a debt of gratitude to the loggers and truckers whose labors, so many years ago, provided the wood products we all have used. And today as a result of their efforts a pathway was provided that made the Banadad possible. One of the truckers who worked on the Finn Lake Road was Dave Mealey of Silver Bay, Minnesota. He recently reminded me of some of history surrounding the construction of the Finn Lake Road and the Moon Lake Timber Sale. Heavy rains the past few weeks caused Poplar Creek to over flow its banks. So far no damage to recently build bridge but some of gravel on the approachs to the bridge have been washed-out. Temperature this morning was 23 degrees but the rain and snow has stopped and the sun is out. The last few days it has been rain. Poured on Monday. The lakes levels have risen a lot since Sunday. Then this morning, Wednesday, it started to snow. No accumulation of snow on the ground yet but it is snowing quite hard. The temperature is 32 degrees. Today's snow should remind everyone when spring comes to the Gunflint Trail winter and the ski season is not far behind. You can keep in touch with winter on the Gunflint at www.gunflintskiing.com . Yesterday when driving down the Little Ollie Road near the Poplar Creek Guesthouse I spotted a timber wolf about 50 yards ahead of my truck. I stop and watched him for about five minute. The wolf looked and did not move for quite awhile. This one like many wolf I have sighted over the years, he or she seem real curious on what I was up to. This past year we had quite a few wolves around our neighborhood. I saw them on three other occasions this winter, heard them howling many time lately and there was not a day when I was out on the Banadad that I did not see wolf tracks, usually many, along the trail. Of course what brought the wolf in are the large number of deer we now have in the area. The Blue Heron B&B located on Farm Lake near Ely has a reputation as one of the area's finest places to dine. Much of this reputation was certainly attributable to their great chef Roy Misonznick. According to Josie Milan, Blue Heron manager, Roy is leaving and going onto other pursuits. Owner Jo Milan and Josie are in search of a new chef to carry on the fine tradition started by Roy. Until a new chef is found the B&Bs restaurant will only be open to B&B guest. Having stayed at the Blue Heron last week, I would highly recommend it. Creek flowing, snow mostly gone, bright sunny morning and the forecast is for the temperatures to reach into the fifties. Yesterday morning we awoke to a one to two inches of snow. It snowed all day then the sun came out and the snow melted. Eighteen degrees this morning but the temperature is going up fast. In case you had not noticed, there has not been any posting in the Edge for about a week. We were on vacation visiting B&Bs and in other part of the state. First night was at the Water Street Inn in Stillwater, a great place to stay and we recommend their dining room. While in Stillwater we dropped-in at the River Town Inn, the Elephant Walk B&B and Ann Bean Mansion. Only sorry we did not have enough time for all of Stillwaters fine B&Bs. Next stop was a real treat-great dining and lodging at New Prague famous but soon to close Schumacher's Hotel. Our return trip included a stop at Hibbings newest B&B the Mitchell-Tappan House ( no web site yet but the phone number is 888-662-3862). And our last night was spent at Ely's Blue heron B&B which as always was outstanding. We highly recommend all these B&B or for that matter all the B&B through Minnesota who are members of the Minnesota Bed and Breakfast Association. We have now returned to the Gunflint and our wonderful part of the planet. According to our neighbors, for the past several days it has snowed each morning. Three mornings ago, depending upon who I talked to, there was anywhere from four to eight inches of new snow on the ground. During the days it melted. This morning out my window I see there is just a dusting of snow and the temperature is 29 degrees. Still a few patches of deeper snow lingering in the woods. News from the Gunflint Trail Association (the Trail business group)- Gunflint Trail Association Spring Picnic on Monday the 2nd of May. Food, beverage and utensils will be provided so just bring yourself to Gunflint Pines at 7:00 PM for some good old fashioned neighborly fun. Dress is casual and family and friends are invited.